Good leaders recognise it is vital for them to communicate a clear story, strategy and road to success. They also know it is vital to manage by outcomes, rather than by tasks, and give their people support to do the job. This calls for having self-managing people who take responsibility and make their best contribution to delivering success. Let’s explore the idea of encouraging people to take ownership. Looking back on your life, can you think of a time when you took ownership for shaping your future? You may have chosen to take a key step in your life, tackle a challenge, overcome a setback or whatever. What did you do to take responsibility for moving towards achieving your goals? 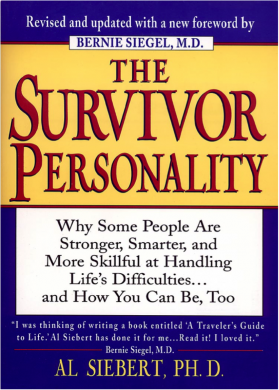 Al outlined some of the strategies survivors adopt to overcome crises successfully. These include the following. They quickly read the new reality and see patterns. They stay calm and maintain a sense of perspective. 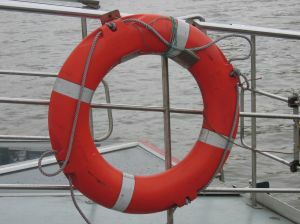 They have life-competence that helps them in emergencies. They explore the options for going forward – together with the consequences of each option – and choose their way forward. They totally commit to doing their best. People also take ownership in positive situations. They choose to be proactive and take responsibility for their own development, encouraging others, inventing new products, improving the quality of life or whatever. 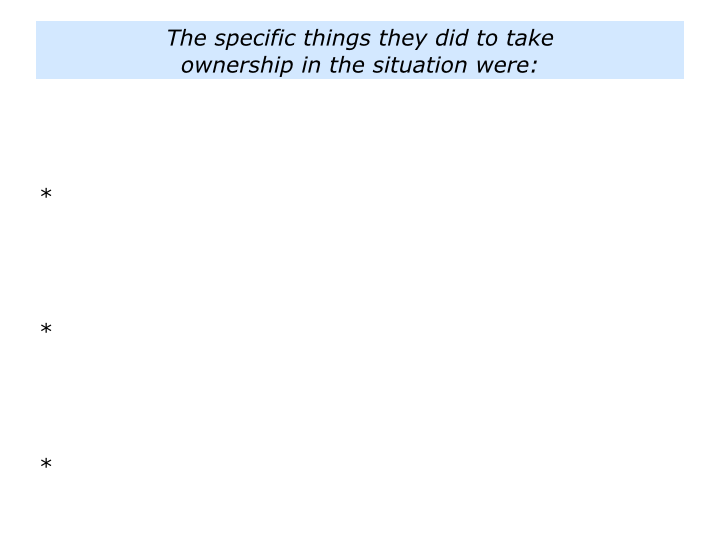 Describe a specific situation in which you took ownership. Describe the specific things you did then to take ownership in the situation. Describe the specific things you can do to continue taking ownership in your life and work. One company I worked with consistently highlighted how its people had lived the values. One of the values was around taking ownership. The values were integrated into every aspect of the organisation’s life. Before candidates came for interview, for example, they were sent an introduction to the values. 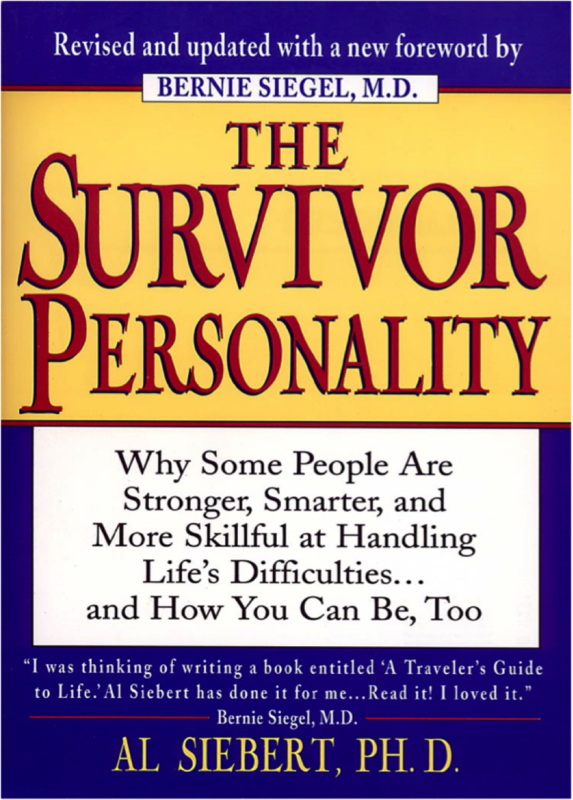 This included success stories showing how people in the company had tried to live the values in real life situations. The candidates were invited to do some homework and share this at the interview. 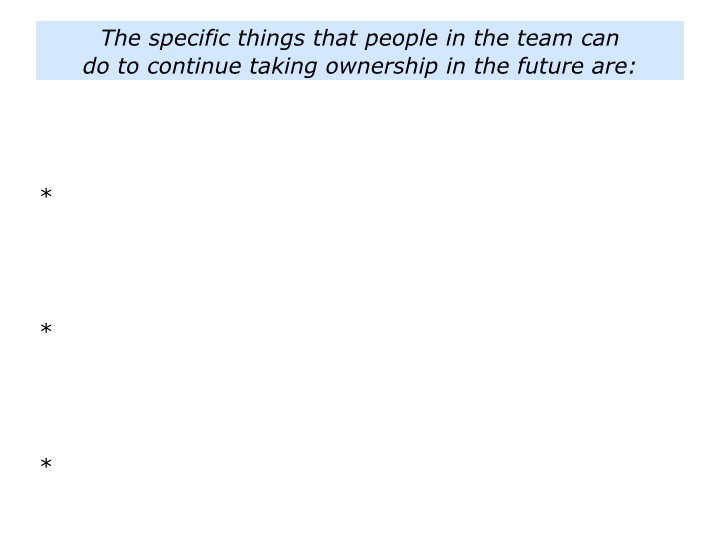 They were asked to pick one of the values – such as taking ownership – and do the following things. Describe a specific time when you tried to follow the value in your own way. This could be any situation from your personal or professional life. Describe the specific things you did to try to translate the value into action. Describe the specific things you would do in your first month in the company to try to live this value in your own way. “That sounds tough,” somebody may say. Yes, it was. But the company believed that the selection, induction and probationary stages were vital. Get these right and the benefits were enormous. Get these wrong and it could take ages to rectify the damage. To take care of a visitor who was unsure where to go. To make sure any problem with physical things – such as coffee, the laptop projector, the toilets or whatever – was fixed immediately. To schedule regular updates with the key stakeholders in the company to report on the team’s progress towards achieving the goals. To proactively visit customers – both external and internal – to see how the service your team is providing can be even better. To take charge of their own development by studying and, where appropriate, applying new ideas in their field. If you wish, try tackling the exercise on this theme. 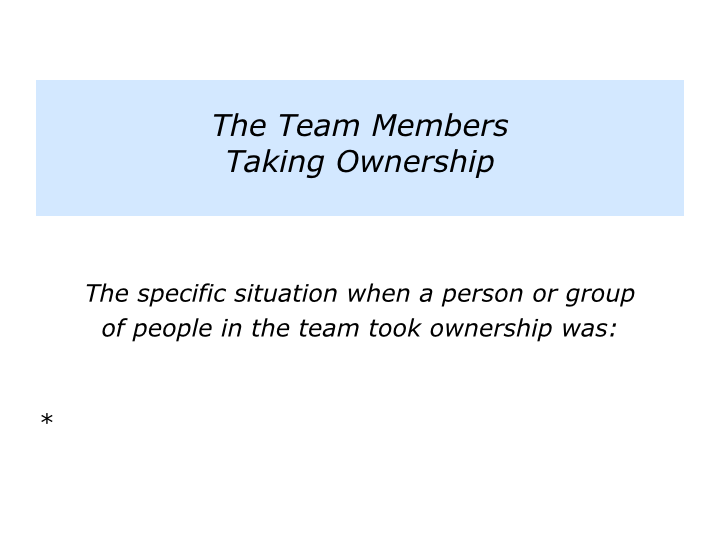 This invites you to describe a specific time when people in the team took ownership. They communicate the story, strategy and road to success. They describe the ‘What, Why, How, Who and When’. They invite people to reflect on the contribution they each want to make towards achieving the picture of success. 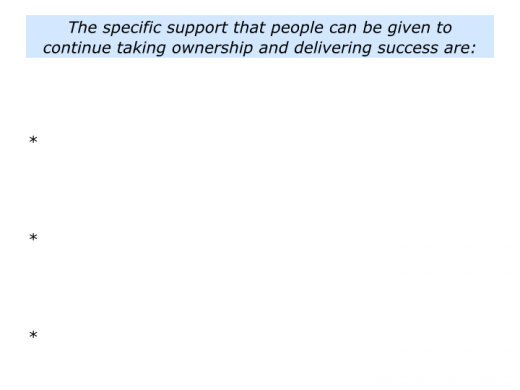 They make clear contracts with people about the goals they want to achieve – which are written in outcome terms – and the support they need to do the job. They manage by outcomes and continually focus on the goals people aim to achieve, rather than micromanaging them by tasks. They enable people to do superb work, find solutions to challenges and deliver the picture of success. Good leaders recognise that they cannot actually ‘manage people’. Such an approach would be patronising, because people manage themselves. They can provide people with an inspiring framework, however, and the support they need to do the job. Leaders can then manage people’s contributions towards achieving the team’s goals. Good teams are made up of people who aim to be positive, professional and peak performers. They have many people who take ownership and help the team to achieve success. 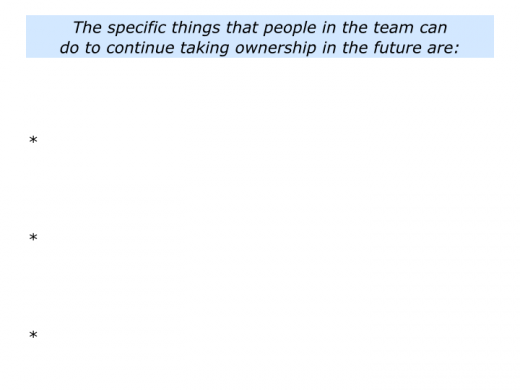 Describe the specific things that people in the team can do to continue to take ownership. 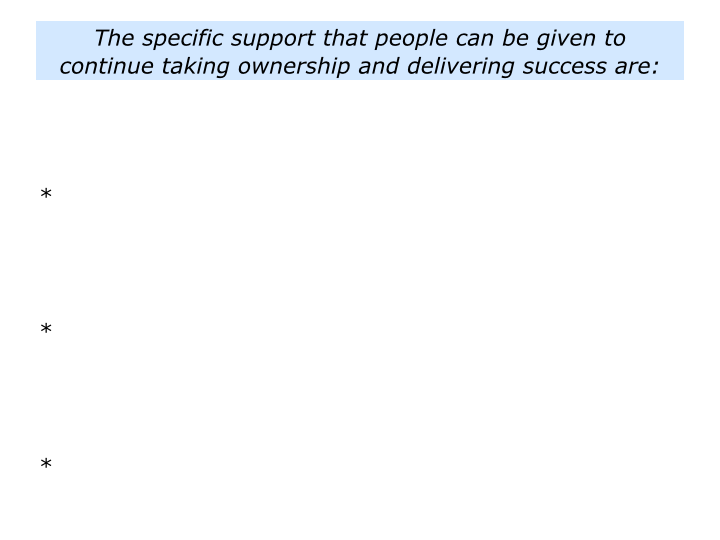 Describe the specific support that people can be given to encourage them to take ownership and deliver success.